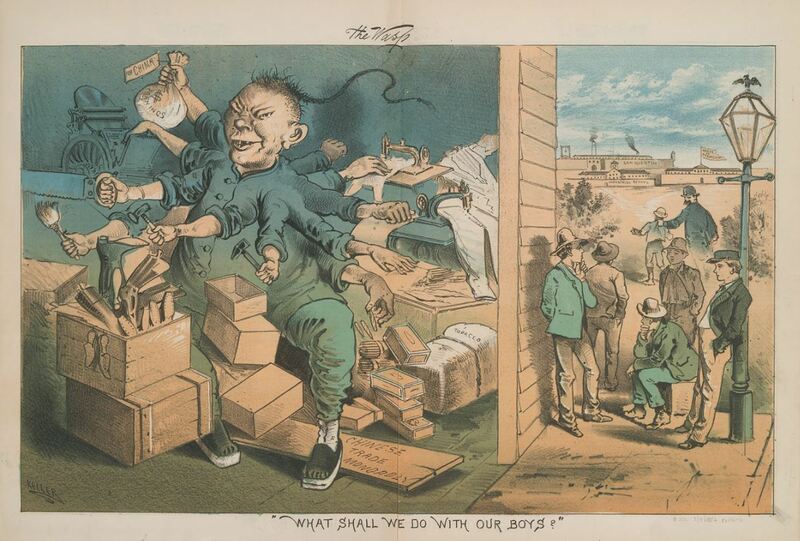 This 1870 cartoon is not typical of Nast’s images and his images of the Chinese in America in general. It is uncharacteristically dark in tone and density, and it is the only Nast cartoon that pictures the Chinese as anything other than a human being. China was known as the Celestial Empire. Playing upon the term “celestial” Nast captures the growing curiosity of New Yorkers about Chinese Americans who are arriving in New York City in greater numbers. 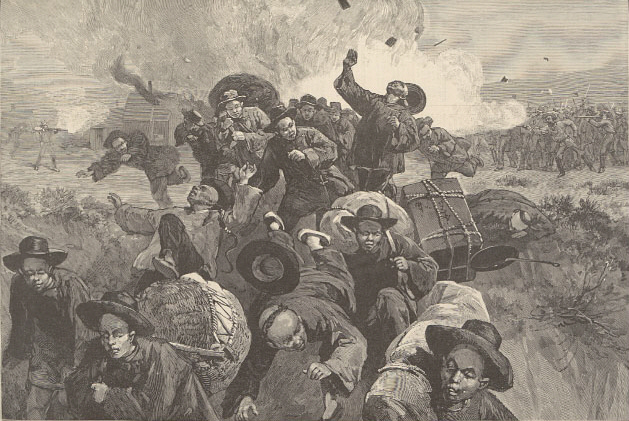 The majority of Chinese Americans resided on the West Coast, coming to America in order to escape extreme financial hardship and widespread famine in their native China. 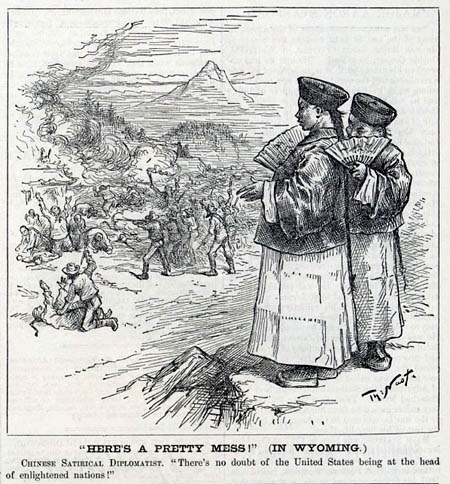 “Thousands of Chinese, mostly Cantonese” responded to the 1848-49 California Gold Rush and were recruited to help build the Transcontinental Railroad and the “economic development of the West” (Choy 19). Soon after they arrived on the West Coast, the Chinese experienced prejudice and legislative roadblocks which prevented them from assimilation, attaining citizenship and enjoyment of rights commonly extended to other immigrants. 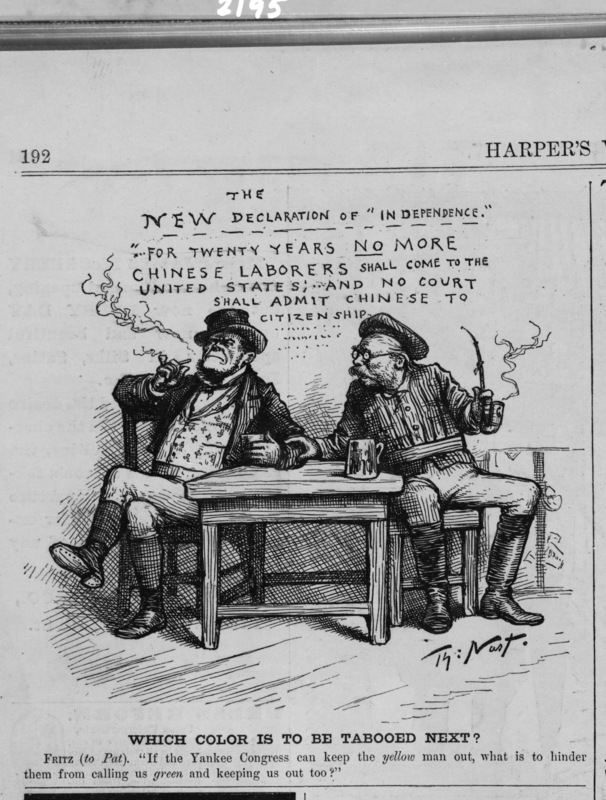 Most white labor interests in the U.S. considered the Chinese “sojourners” or temporary workers with no desire to earn citizenship or assimilate into American culture. Since existing laws prevented naturalization, the Chinese were forced and locked into this perception. 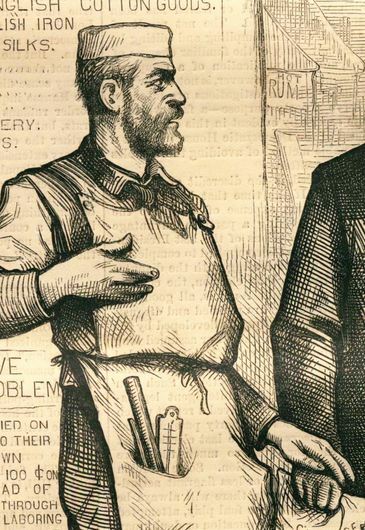 In 1873, the United States suffered a severe economic recession and the economic uncertainty permeated at state and local levels. 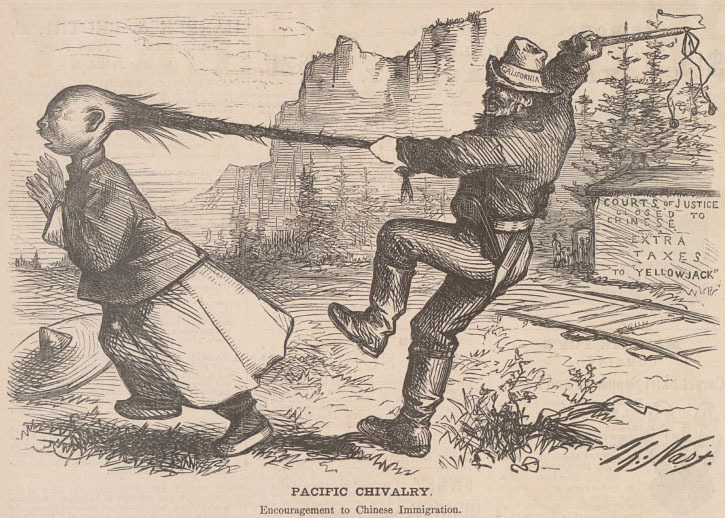 The growing white population in the western states, particularly in California, increasingly viewed the Chinese as unfair economic competitors. Employers appreciated the Chinese. They were industrious, productive employees, often willing to work for less. 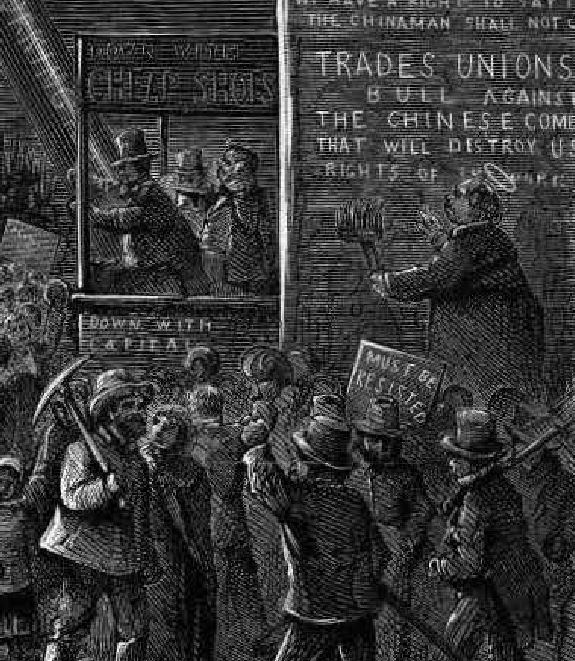 However these Chinese were not “coolies,” or “slave labor” and would strike for better working conditions and wages when they felt unfair conditions existed. This recession fueled white angst regarding labor issues – the leading factor driving the “The Chinese Must Go” anthem. 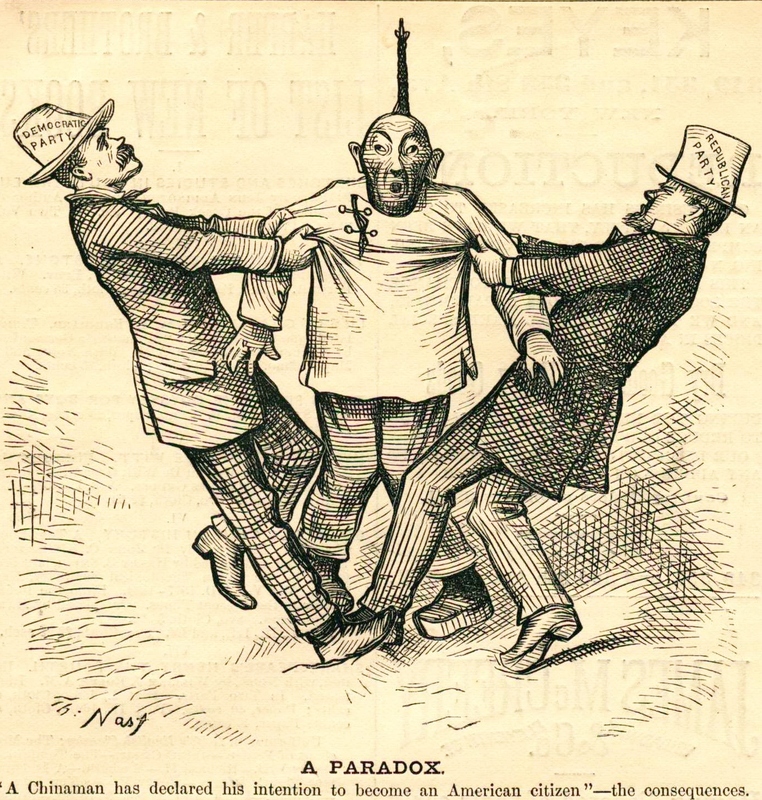 Before the Civil War, a very small Chinese population (as low as 38 or as high as 60 depending on sources) resided in New York, in close proximity to “the impoverished, Irish-dominated Fourth Ward to the east of Five Points” (Anbinder 396). These New York Chinese lived quietly among the other immigrants and rendered services such as selling rock candy and cigars. Due to a lack of Chinese women in America, and Irish women’s lack of suitable Irish partners, Chinese-Irish marriages, though rare, did exist and were tolerated. As experienced sailors, many Chinese males settled in the port city. Some Chinese were escaped “coolie laborers” who had been forcibly or unfairly tricked to work on ships. New York provided an escape to deplorable working conditions that existed along the southern Atlantic (Anbinder 396). Eighteen hundred and seventy was not the first time that crowds of New Yorkers had encountered the Chinese however. In the eighteenth century, Americans were curious and respectful concerning the nation and people of China. In the mid-nineteenth century, attitudes about the Chinese declined in the aftermath of the Opium Wars (1839-1842). As early as 1847 New Yorker’s attitudes about the Chinese had “shifted dramatically.” In the summer of 1847, New Yorkers “were treated to a spectacular sight: a 160-foot Chinese vessel called the Keying” (Tchen 63). Tchen describes the arrival of the Keying into the Battery area of New York Harbor where thousands came to watch, and later pay twenty-five cents to tour the unusual looking trading ship. Newspapers offered daily coverage and an estimated 4,000 people a day came to see or tour the craft. In addition to the goods and surroundings of the Keying on display, New Yorkers were promised a spectacle of the strange religious practices by the Chinese crew – “a once in a lifetime chance of seeing something authentically Chinese.” A variety of creative license and speculative promoting had led New York spectators to expect sacrificing, dancing, rituals, and examples of opium-induced stupor. It was as Tchen describes, a “packaged otherness” (67). The New York Herald observed, “They [the Chinese] are peculiarly attached to old notions, and will not permit the slightest innovation in anything” (qtd. Tchen 68). 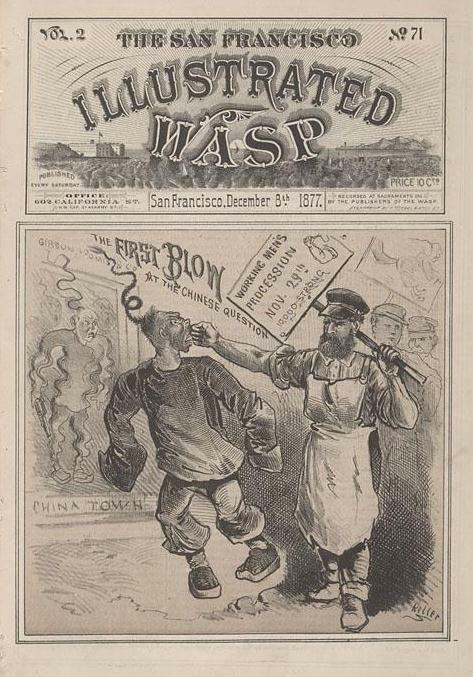 Later, a labor argument between the Chinese crew and the captain resulted in violence, which the New York press took note of and blamed squarely on opium-induced behavior. 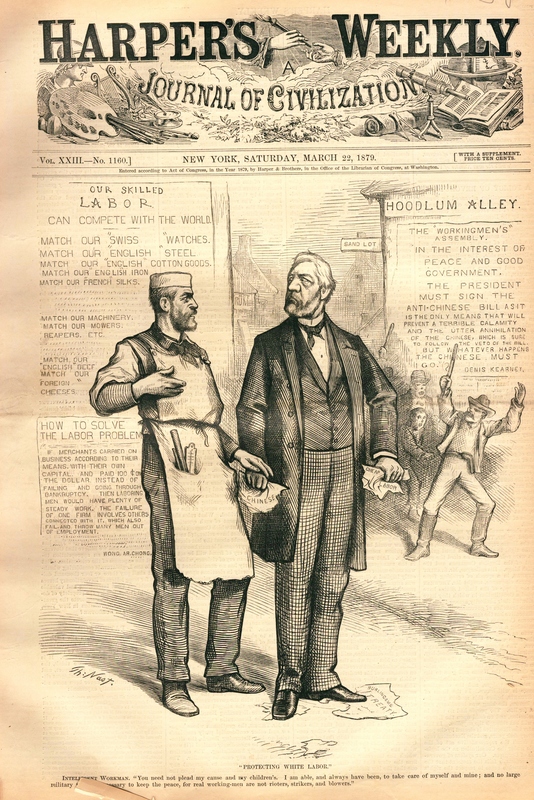 Throughout the Keying’s stay in New York City, western culture scrambled to exploit the “exotic foreignness” and racial differences of the crew (Tchen 70). 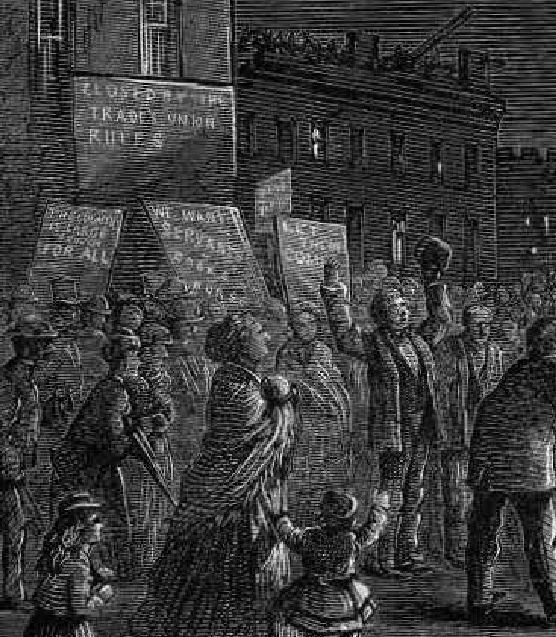 Whatever the circumstances of their arrival, regarded either as coolie escapees or as a people driven out of California due to Sinophobic hysteria when the Chinese settled in New York City they began to organize. Their community leaders sought out properties to rent or purchase/ in order to establish an enclave where the Chinese could live and operate businesses and receive mutual support. This concentration of Chinese residences and storefronts, despite being statistically very minute, commanded New Yorkers’ attention. “It seemed to many observers that Asians had overrun the neighborhood” (Anbinder 399). Lower Mott Street in the Sixth Ward became the foundation of what by 1880 was known as China Town (Anbidner 398). Nast sympathetically depicted the Chinese in six prior renderings. This particular Nast’s drawing may represent his desire to capture the mood that Anbinder references – the local reaction, awareness, and curiosity of a changed presence in the largely white, Euro-centric community. 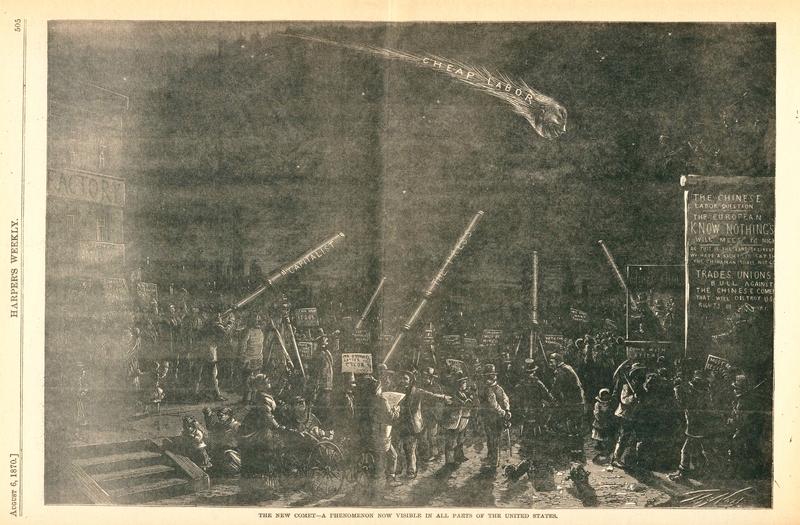 This atmospheric arrival from another world drove families out of their homes so that they could get a good look at the occurrence – the Chinese novelty – streaking against the dark, starlit sky. A smiling Chinese face, with a smug expression, comprises the large comet head. The tail of the comet, a Chinese pigtail or queue, is emblazoned with “Cheap Labor” a message that is met with mixed reaction to the fascinated audience below. The reaction of witnesses to the celestial arrival is divided. They are in halves, welcoming and wary. Spread out across the scene, large telescopes labeled “capitalist,” “the police,” “the press,” and “working man,” focus their lens upon the”phenomenon” as it enters their world. A characteristic technique of Nast’s was to visually split his scenes and feature opposing views – pitting his subjects against one another to visually differentiate contrasting attitudes. This cartoon is no different. The left side of the illustration represents the pro-capitalist (and progressive) stance toward the Chinese’s arrival. A tall factory frames the scene. They clearly rejoice at the prospect of what the Chinese arrival might contribute to progress and industry. Signs rise from the crowds and declare, “Let Them Come,” “We Want Servants, Cooks and Nurses,” and other positive messages welcoming the addition of Chinese labor. The people on this side of the harbor bring out their families to witness the event. A child and a man are seen throwing up their hands in exclamation. A woman clutches her hands to her chest in a hopeful posture. Tchen observes that Nast is not taking a position with this cartoon. Nast simply documents the two different states of mind in his hometown. Perhaps, it is for this reason that Nast has chosen to objectify the Chinese as a comet – not because he feels the Chinese are other-worldly – but because the New Yorkers already feel this way. Tchen speculates upon this same possibility, for he does acknowledge the pro-Chinese positions and convictions seen in Nast’s later cartoons. Yet, Tchen is not completely comfortable that Nast did all he could with his body of work to convey a progressive attitude toward the Chinese and encourage further understanding of the obstacles they faced in America. In particular, Tchen finds it hard to explain Nast’s reasoning behind the creation of “The Martyrdom of St. Crispin,” drawn a month earlier. 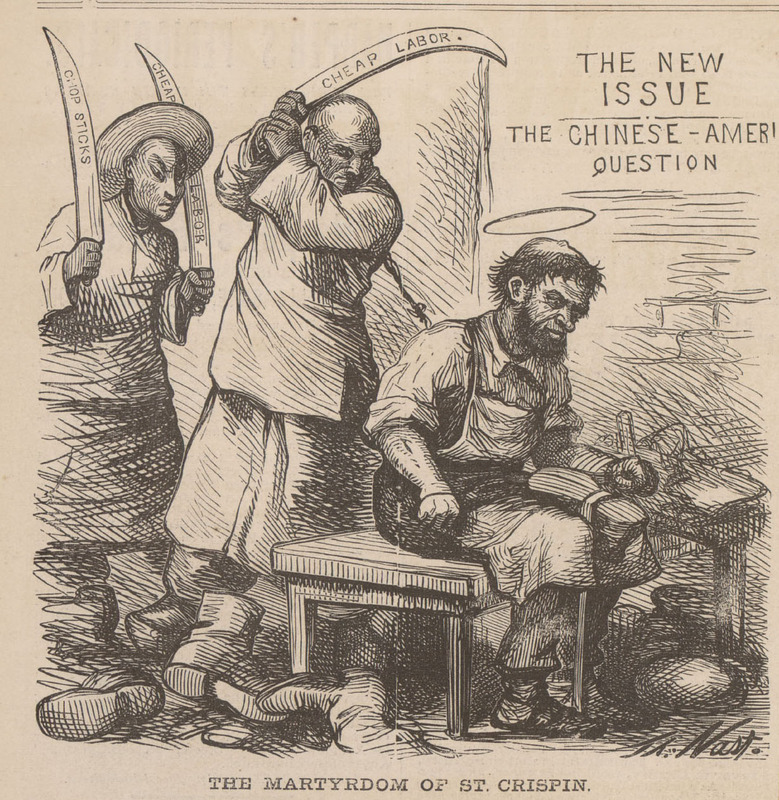 Lenore Metrick-Chen disagrees, pointing out that this particular issue of Harper’s Weekly refers to the Chinese no less than eight times and feels that the magazine advanced a negative feeling about Chinese immigration and general unease of the Chinese (39). We may never know what existed in Nast’s mind or heart – and indeed he may have felt as curious and as astonished as the general public. 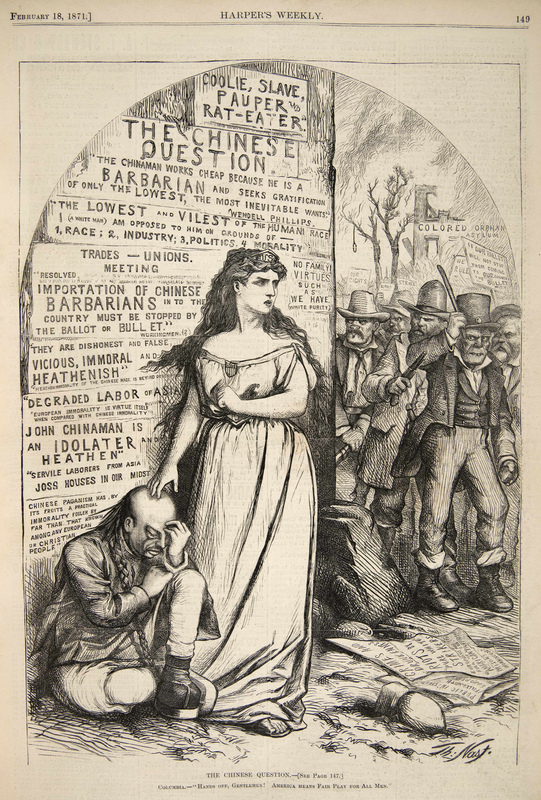 This particular drawing is often shown to depict Sinophobia and as an example of turning a minority race into an “other.” Seen alone, without Five Points backstory, modern viewers may not appreciate how the approach of the major change or perceived phenomenon resonated in the community. Right or wrong, Nast piece records that New Yorkers at the time they took notice, and while the newcomers were viewed as strange and different, attitudes about the Chinese were divided. As a documentary image, Nast’s Chinese comet head is better understood. It captures the public reaction and sensationalism that existed and should be seen in that light, rather than as a reflection of Nast’s personal beliefs or prejudices. 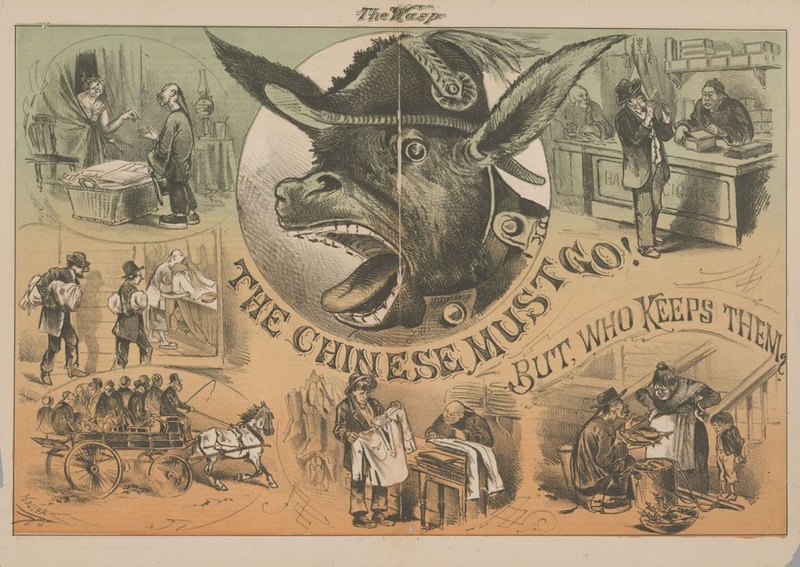 Nast was not 100 percent consistent or admirable with his depictions of the Chinese, but if this example is to be viewed as an editorial, it is an accurate depiction of how New Yorkers felt about the Chinese arriving, and not an offering of Nast’s personal beliefs. 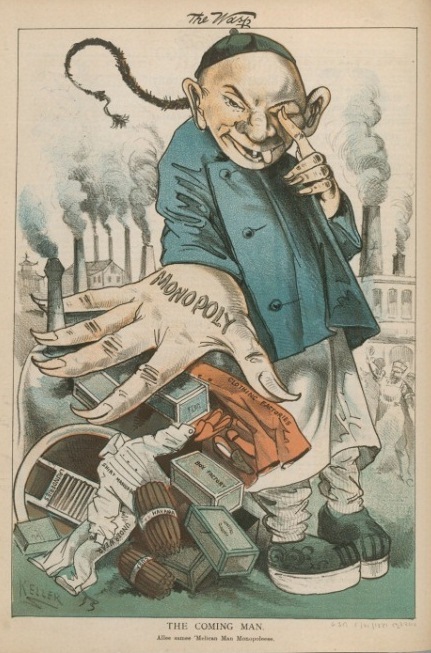 As a Radical Republican, Nast would have aligned with capitalists and welcomed the Chinese as a valuable addition to the workforce and overall commerce in general. In The New Comet, Nast accurately captures the pro and con attitudes that together objectified and sensationalized an increased presence of Chinese in New York City. Blaine was a three-time presidential hopeful. 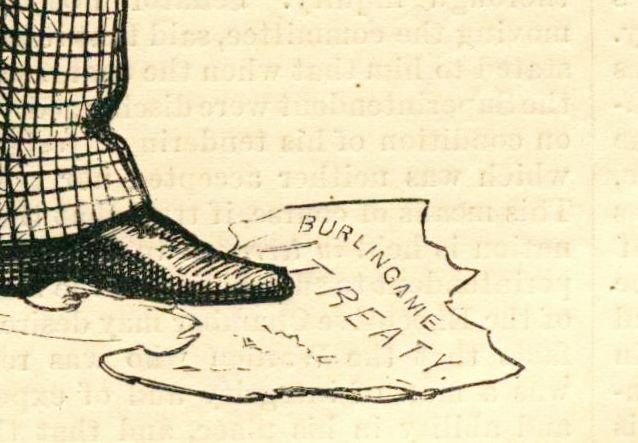 With corrupt scandals of the Grant administration surfacing and swirling in political circles, and with no signs of public sentiment shifting in favor of the Chinese, Blaine courted Democratic voters and advocated for a revision of the 1868 Burlingame Treaty. The treaty was the product of negotiations between the Chinese Six Companies, “the most important association representing the Chinese community and the federal government” (Takaki, 113). The more groundbreaking articles of the treaty included measures that promised the Chinese the right to free immigration and travel within the United States, and allowed for the protection of Chinese citizens in the United States in accordance with the most-favored-nation principle” (U.S. State Dept.). The treaty was “a major victory for the Chinese” (Takaki 114). Republican politicians who wavered and bowed to the growing anti-Chinese mob pressure alarmed the artist. 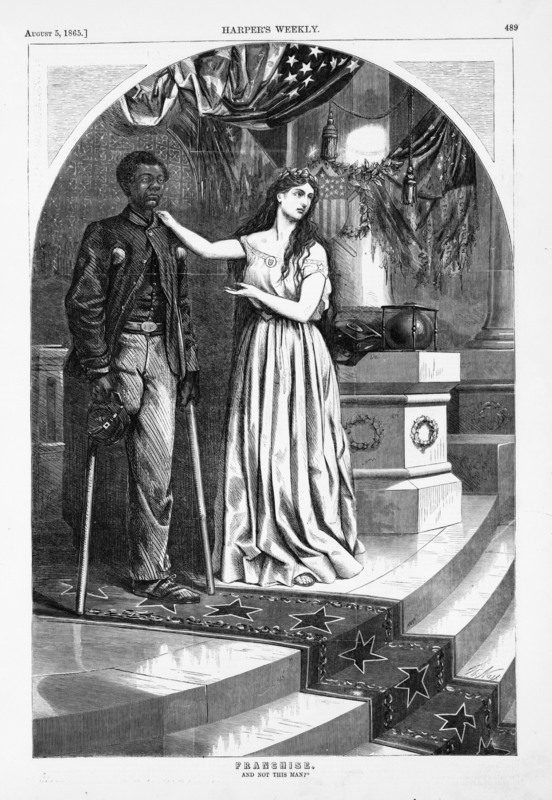 “Nast never had the slightest sympathy with any sort of organization or movement that did not mean the complete and absolute right of property ownership, as well as the permission to labor, accorded to every human being of whatsoever color or race. 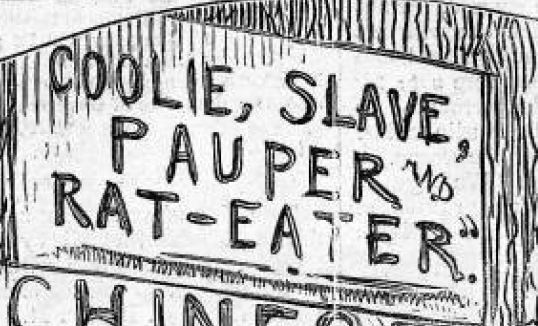 His first real antagonism to James G. Blaine began with the latter’s advocacy of Chinese Exclusion” (Paine 386). Nast viewed the attempts to abrogate the treaty, and Blaine’s role in that shift, as deplorable and an unforgivable breach in Republican values. As Nast’s biographer points out, Nast frequently lampooned Blaine in order to expose his hypocrisy, a reality that made Blaine “heartsick” given his national ambitions. Nast was for Blaine, a painfully persistent pest. Blaine was all too aware that Nast’s sphere of influence on the electorate was wide. Nast relished exposing Blaine’s hypocrisy. Nast’s fixation on Blaine was unrelenting, nearly equaling his Tweed/Tammany days. The adverse attention worried Blaine, who “attempted to explain and to justify his position, but the artist could see in the Chinese immigrant only a man and a brother, trying to make a living in a quiet and peaceful manner in a country that was big enough for all” (Paine, 413). 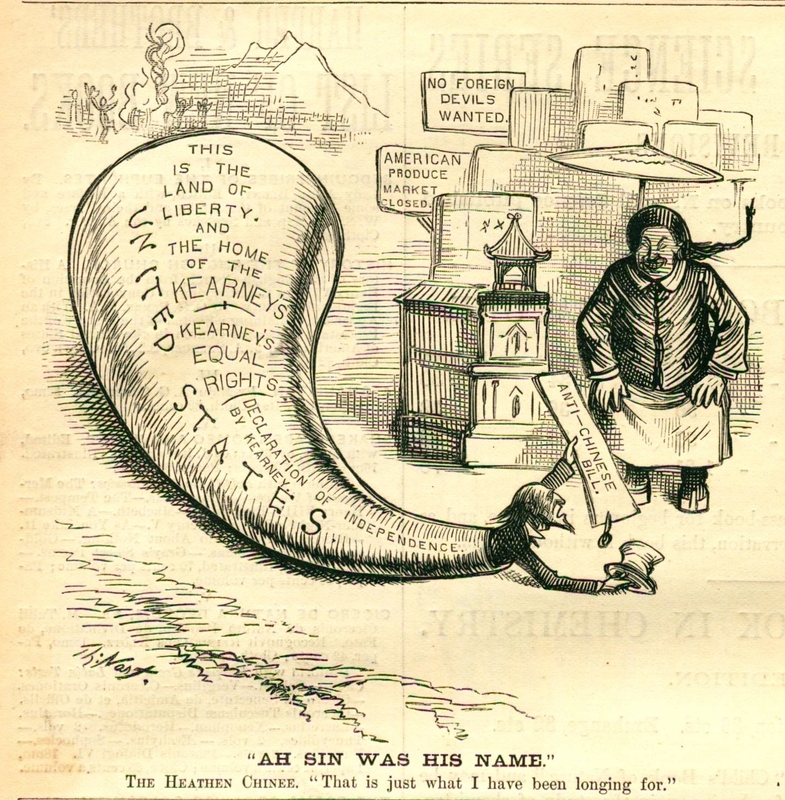 The cartoon also capitalized on the popularity of a popular 1870 poem, Bret Harte’s “Plain Language from Truthful James,” with Nast exploiting James Blaine as Harte’s fearful and deeply suspicious character. 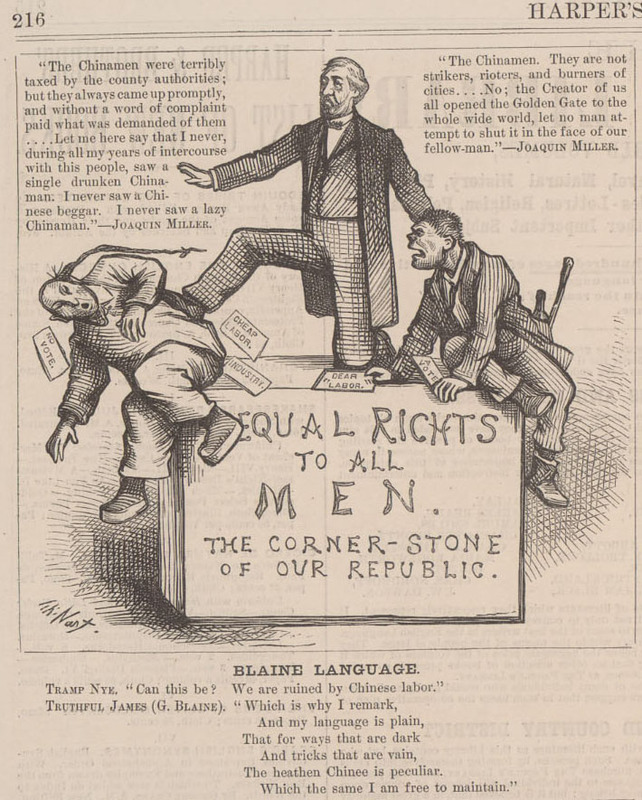 Blaine is seen center at the top of an equal rights podium, welcoming an Irishman on right, and giving him space on the platform by kicking off a Chinese worker. 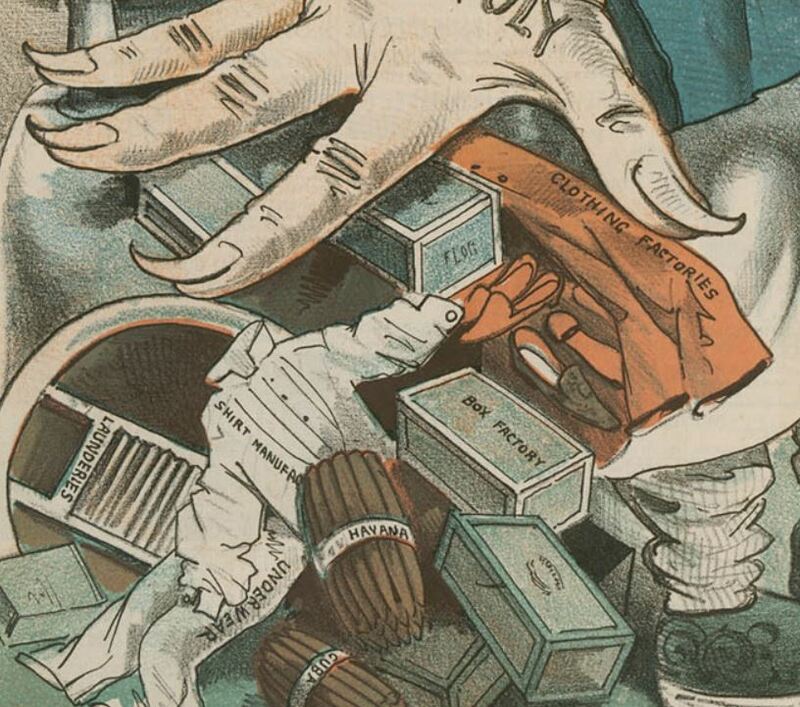 The irony that both ethnic groups arrived in the U.S. to flee famine, was not lost on Nast. All of the accusations leveled at the Irish by Protestants, e.g. 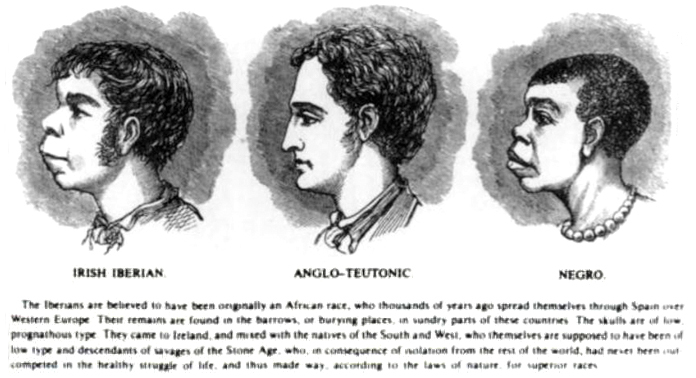 cult religion, large numbers (hordes) of poor and diseased people of a different race (the Irish were thought to be of a different race) who would ruin and dilute American culture, and an unwillingness to assimilate, became the exact charges the Irish leveled against the Chinese.